If you've been struggling to lug your 5 GoPros around with you, then enter the Seeker, GoPro's very own weather-resistant backpack (or sportpack if you follow GoPro's terminology), that promises to keep your action cameras safe and sound when you're on the move. 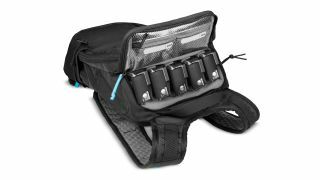 There is enough space to neatly line-up 5 GoPros (its compatible with all models) in the zipped soft-lined top compartment, along with additional batteries and cards. The main compartment has 16L of storage for your other stuff you might want to take with you, while its also hydration-compatible, with space for a 2 litre bladder. To differentiate it from any other action backpack, the Seeker features an integrated chest-mount for your GoPro, so you can capture hands-free footage, while there's also a shoulder mount as well. Priced at £149.99 ($169.99), it weighs just under 500g at 454g and measures 16 x 29 x 50cm. Its not the first weather-resistant backpack specifically designed for GoPros - Thule has a growing range for instance, but this certainly looks like one of the most compact and lightweight versions we've seen to date.